What’s scarier than a roller coaster? The inevitable oncoming doom of modern civilisation, obviously, but also, spooky roller coasters. 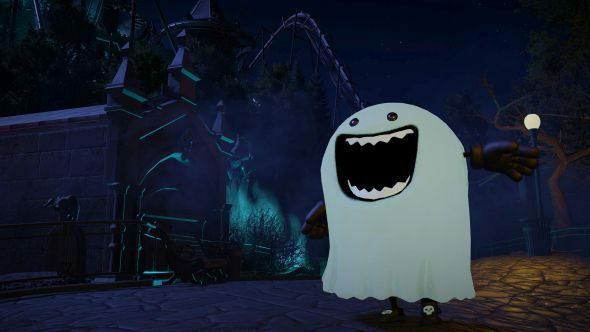 Such is the concept of Planet Coaster’s Spooky Pack DLC, tactically timed a month out from Halloween for surprise spooks. There’s a trailer above, and you can see what’s inside below. Here are the best Planet Coaster creations we’ve found. There are “hundreds” of new scenery pieces, including some of just about everything and themed hats. Hat DLC, in fact: Frontier know what they’re doing in the modern world. There’s also a batch of building pieces, of course. Two new rides arrive alongside, with The Hoax haunted house for small spaces and The Huntsman being a motion-platform – a first for Planet Coaster that moves around your park without a track. Also, a guy in a massive ghost costume can now be paid to scare people who come to the park. Now that’s what I call capitalism. It’s live on Steam right now for £7.99 / $10.99 / €10.99. Full details on everything inside as well as the patch that arrived alongside are available in a blog post.